Jesus is all-powerful. 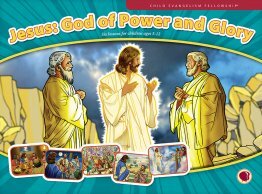 Through this six lesson series you will display for the children the power and glory of Jesus. Lessons cover the teachings of Jesus, Jesus calming the storm, Jesus feeding the 5,000, Jesus offering hope to a Samaritan Leper, and Jesus revealing His great plan to His disciples through the transfiguration. This series also includes an exciting Penguin review lesson. Using these lessons you will show the children how our all-powerful Savior has made a way for them to be forgiven and have a relationship with Him.